John currently conducts research on the life cycles of migratory birds, with a focus on breeding biology. He does some work on the non-breeding component of some species as well. He currently studies the Painted Bunting (NC/SC), Black-throated Green Warbler (NC), Swainson’s Warbler (NC/SC), Golden-winged Warbler (Nicaragua), and plan to add Worm-eating Warbler in 2013. He did a collaborative study of breeding Yellow-bellied Sapsuckers in NC for several years; those data are being analyzed. John primarily uses radio telemetry to study space use, nesting chronologies and reproductive success. He is involved in collaborative projects looking at stable isotope chemistries in Swainson’s, Wilson’s, and Kentucky warblers. 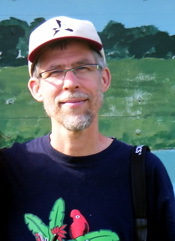 He is also involved in a collaborative population genetics study of several species, including Black-throated Green Warbler and Yellow-bellied Sapsucker. He is involved in a “working group” that is assessing the breeding status and conservation needs of the Black-capped Petrel on the island of Hispaniola. Grants and other logistical support from the USFWS, SC DNR, NC Wildlife Resources Commission, NPS and private groups support much of the field and lab work. John is the Chairperson for the Scientific Council on Rare, Threatened, and Endangered Birds of NC. He serves on the Board of the Wake Audubon Society, and the Important Bird Areas Technical Committee for Audubon NC. He serves on the NC Partners In Flight advisory committee. He co-leads ecotours to local, national and international destinations. He has been co-leading an annual bird banding/ecotour trip to various Shade-coffee plantations in northern Nicaragua since 2005. Chandler, R.B., S. Tolfree, J.A. Gerwin, C. Smalling, L. Chavarria-Duriaux, G. Duriaux, and D.I. King. In press. Conservation implications of Golden-winged Warbler social and foraging behaviors during the non-breeding season. Studies in Avian Biology. CRC Press. Samuels, I., P. Bichier, J. Clark, T. Milleron, and B. O’Shea. 2014. Noteworthy records and range extensions from the Caura River watershed, Bolivar state, Venezuela. Cotinga 36: 28-40. O'Shea, B.J., and S. Ramcharan. 2013. A rapid assessment of the avifauna of the upper Palumeu watershed, southeastern Suriname. pp. 145-160 in Alonso, L.E., and T.H. Larsen (eds.) A rapid biological assessment of the upper Palumeu River watershed (Grensgebergte and Kasikasima) of southeastern Suriname. Conservation International, Arlington VA.
Bishop, J.T., J.A. Gerwin, and R.A. Lancia. 2012. Nesting ecology of Swainson’s Warblers in a South Carolina bottomland forest. Wilson Journal of Ornithology 124: 728-736. O’Shea, B.J., L.E. Alonso, and T.H. Larsen (eds.). 2011. A rapid biological assessment of the Kwamalasamutu region, southwestern Suriname. RAP Bulletin of Biological Assessment 63. Conservation International, Arlington, VA.
Savage, Amelia L., Chris Moorman, John A. Gerwin, Clyde Sorenson. 2010. Prey Selection by Swainson’s Warblers on the Breeding Grounds. Condor 112(3):605-614. O’Shea, B.J., C.M. Milensky, S. Claramunt, B.K. Schmidt, C.A. Gebhard, C.G. Schmitt, and K.T. Erskine. 2007. New records for Guyana, with description of the voice of Roraiman Nightjar (Caprimulgus whitelyi). Bulletin of the British Ornithologists’ Club 127: 118-128. Hazler, Kirsten R., A. Amacher, R. A. Lancia, John A. Gerwin. 2006. Factors Influencing Acadian Flycatcher Nesting Success In An Intensively Managed Forest Landscape. Journal of Wildlife Management. 70(2) 532-538. Peters, Kimberly A., R.A. Lancia, John A. Gerwin. 2005. Swainson’s Warbler Habitat Selection in a Managed Bottomland Hardwood Forest. Journal Of Wildlife Management 69(1): 409–417. Mitchell, Michael S., R.A. Lancia, John A. Gerwin. 2001. Using Landscape-Level Data To Predict The Distribution Of Birds On A Managed Forest: Effects of Scale. Ecological Applications. 11(6), 1692-1708.